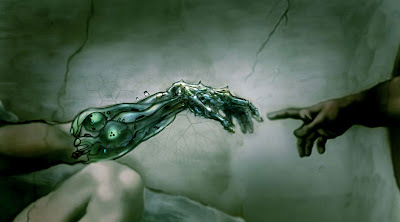 Are Transhumanism and Christianity inherently opposed to each other? We think not. Here’s why. In recent years, as the Transhumanist Movement has become better known, it has been seen as an enemy of spirituality and religion. To others it has been seen as part of a conspiracy to take away the freedom of the people by influential elites. It is true, that many transhumanists are atheists. Not all are however. It is also true that some members of the transhumanist movement mock religion in all its forms. Yet this is no different than Christians mocking atheists, of which there are a great number. This atmosphere creates suspicion, animosity and in the end confusion at a time in which humanity needs to see things clearly. We will try to demonstrate how there is nothing in the Bible that would speak against any of the basic principles of transhumanism. First we must state the main tenet of transhumanism. Transhumanism’s main idea is that the physical limitations of the human body can and should be overcome. The first goal is supersede the limitations of our biology, with the eventual goal of merging our bodies with machines, most likely the computers, rendering us cyborgs. The ultimate goal of this movement might be the installation of consciousness inside an otherwise artificial machine. To many who are first hearing these words, these things may seem like science fiction or things that will happen in an age far in the future. Whether this is so or not, is not the point of this article. But suffice it to say that in human history things which would have seemed impossible have come to pass. We doubt that the Wright Brothers, would have envisioned of multiple trips to the moon by men only 50 years after their flying machine was flown. Just because some members of the transhumanist community are atheists is not enough of a reason for those who believe in a personal God to reject their research and results. No technology should be judged primarily on the metaphysical beliefs of those who developed it. If one rejects this view, then that person is left considering ridiculous things like determining the religious belief system of those who develop medicines, cars, cell phones to decide whether they will use them or not. Some Christians may say that there is a difference here between cell phones, medications, etc., and attempts to model human consciousness. And certainly there is. Some Christians may say that these efforts will ultimately end in failure. And indeed they may. But what if they do succeed? What if they can model human consciousness in such a convincing manner that no one could distinguish the difference between this kind of machine or a biological human? The critical question is, is there anything in the goals of the transhumanist community that inherently goes against Christianity? We answer no and we will demonstrate why. It is natural for living things to wish to continue living. The rule in nature, animal and human is survival. This is why we eat every day. This is why we avoid oncoming trucks, etc. So it should not surprise us that Jesus espoused this same principles. This passage is full of love and healing. The original ideas that glorified the pursuit of medicine. All of medicine is endorsed in the Bible. 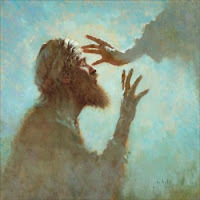 Indeed, Jesus himself is called the Great Physician. It might be said by Christians reading these things that the greater message of the Bible was one of Jesus performing signs and wonders so as to demonstrate that he was the Messiah. But this fact is not the only one being put forth. No Christian can disagree that part of the message was that Jesus by restoring the life of Lazarus, by healing the sick and giving the sight to the blind was doing an inherently good thing. After all, he could have demonstrated his divinity by flinging entire mountains into the sea. No, he chose life extension as his method of showing his very power and glory. We will continue in part 2 of this series to cover other areas where transhumanism and Christian values coincide. Stay tuned. Guillermo Santamaria is an author of the Plus Ultra Tech weblog. Would Anything Change Your BS (Belief System)? Not sure that going one by one through key Christian dogmas addresses the point the best way. There are fundamental matters which unify religion and transhumanism. They exist in the same paradigm – both are based on human beliefs, both offer hope for a better immortal life, both investigate the core of human nature. The ideas of the Christian futurist Feodorov through Cosmism are still fuelling Russian space program. The practical aspects of artificial intelligence and human brain enhancement turn us to phenomena of spiritual enlightenment, moral imperative and other aspects of consciousness where religious thinkers added far more substance to than scientific ones. Pingback: Can I Stick a Chip In Your Brain? The Ethics of Biological and Technological Integration. So much talk about nothing. Religions are untrue and their value is 0. Science is true and its value is 1. Living in “Infinite Space-Time”! No more “human created secondhand God’s”! The function assigned to GOD is now available through understanding the Universe we are part of. age), and “involuntary death” will not exist any more. The fact that you are reading this is a good sign. heaven and presumable not be dead. possible that we can keep on living here, instead of dying and going to heaven. You probably ask, what is this about? will evolve to Homo Immortalis Omnipotent. moral and religious disapproval should not divert us from taking this next step in evolution. that we have assigned to our God’s, are now for us to acquire. The only limit is our imagination! Freedom from death now! OHHHHHHHHHHHH. I get you now. in Mormonism, a god-status is reached right? Yeah, alright, I can see how you make the connection to the two. but no such thing exists in Christianity. Sorry. If you ever read THE Bible and compare it to the Book of Mormon you will find some radical differences. Feel free to represent the differences between the books with actual quotes. There’s no need to invent quotes. Oh, and Mormons aren’t Christians. They’re Mormons. Cannon has presented a basic misunderstanding of Christianity because he isn’t one, and has however presented the fact Mormonism and Transhumanism are compatible. sorry, but just because believers are called “Christians” doesn’t mean we are called to be “Christs” (Christian means little Christ). To be Christ is to be God, perfect in morality and physicality. its impossible. Plus, who would want to live forever? I wouldnt want to have to live on this miserable world with all its depravity for forever! Don’t you realize that imortality here means no life in Heaven? youd rather live HERE than Heaven? I would love to live forever. I would love to live on an Earth that has become a heaven. you know what merges pretty darn-tootin-well with Transhumanism? their main tenant is “we are not this body”..
most strive for liberation from the material body, but it is worth inquiring to vedic religions how their mystical men used to transcend their own bodies. My question is: does transhuman attempts *have* to place the human consciousness in a machine? or could it place the human consciousness in any working system? I am a christian and my father is an extremely well educated minister of the gospel. I asked him fairly recently how he felt about life extension, I was careful to say life extension as a result of treating the reduced quality of life related to old age as I was worried he would disapprove. He told me that life extension was a good idea in and of itself. After this I discussed many aspects of transhumanism with him and the only questions he raised were “what harm could this cause?” and “what is the chance that this could be abused in some way?” the latter generally relating to using technology to keep the elite above the rest of us. He didn’t think that abuse was inherent to these technologies, just something we ought to be careful of as a society. The closest thing he ever seems to have to an objection to these kinds of things is when he sees no point in something. Incidently he thinks the same about tatoos and yet is perfectly happy that his daughter has them, just because he sees it as pointless doesn’t mean he is against it. The end of that was a bit rambling but I hope I’ve given a helpful point of view from a very experienced, well educated and devout christian and clergyman. There is no “Christianity” there are only Christians. It doesn’t matter if the tennats of Christianity agree with Transhumanism. Billions of Christains get everything they believe from their pastor telling them who to hate. You realy think that pointing out bible verses that seem to agree with Transhumanism will make christains okay with it? There are a few bible verses that condone abortion, but they don’t seem to have made much difference. ann – please feel free to live in accordance with your convictions, and I will feel free to live according to mine. This is perfectly OK, provided nobody is forced to live according tot he convictions of others. God, if she exists or cares, should also feel free to try stopping us. We will feel free to fight back. In the mean time, she has graciously endowed us with universes of possibility. Ann, I agree with you — I, too, don’t want to live in a hunk of metal. The human body is beautiful. I want my body to be more beautiful, more functional, more incorruptible. Less than that is not worthy of my religion or my transhumanism. Great article Guillermo, thanks for writing it. Perhaps we live in a simulated world like some comments suggest, which would give a scientific basis to a quasi-Christian mythology. Or perhaps not. Or perhaps something else even weirder. We just don’t know. One thing I know is that we live in a vast and complex universe. There are more things in heaven and earth… and perhaps there are things even more wonderful than our mythologies. YES, DAWKINS. As a scientist, he is open to the idea of a natural progression to god-like abilities, achieved via science and technology, just like Lincoln. And Guillermo. And I.
Giulio, how exactly would you define a “god”. If you mean a more powerful being who will not die by natural means, ok. However the God of the bible is infinite, omnipotent, omnipresent, and omniscient. He is outside of time, eternal, all things were created by Him, for Him, and in Him. He is unique. No offense but you’re gonna need a bigger robot. I’ve heard the question posed, who is closer to God, an archangel or a bacteria in your septic tank. Your answer would be the first but the answer is neither. I understand most here are atheists, hey, that’s cool, free will right? However I would not like to see anyone deceive themselves that this is anything other than an idea with a Jesus sticker on it. Tonweya, imagine that we live in a computed world, and imagine that the computer is a posthuman. If that’s the case then, relative to us, the posthuman computer might as well be described as omnipotent, omniscient and omnipresent. That’s a big robot. What exactly does that mean other than “I cannot refute your comment”. We don’t live in a computed world. This isn’t a sci-fi movie. I get transhumanism for atheists. Eternal life and no accountability, what I don’t get is someone who supposedly believes in God trying to do an end run around Him to get to “eternal” life, even if it is a really poor knock off of His promises. We don’t live in a computed world. Actually, we almost certainly do. The odds are very much in favor of ours being a simulated world…. … and aside from arguments about logical impossibilities, practically speaking the being overseeing such a simulation would be omnipotent, omniscient, and omnipresent. Hi Tonweya. I agree with Lincoln’s answer. You cannot disprove that we live in a computed world, and many top physicists view reality as a computation. I question the understanding of any “christian” who thinks that there may be some compatibility here. The whole concept that there may be some common ground here is ludicrous. You certainly must disregard volumes of scripture. Has science succeeded in detecting a soul or spirit yet, let alone developed the capacity to transfer said soul/spirit from one body to another? Now I understand an atheist wouldn’t see a problem here but a christian? Even for atheists you have a problem. Even if you can duplicate a human like brain, and even if you can access all the information therein, and even if you can copy it into your new super brain, it’s still just that, a copy. You still die. I’m sorry, you may have some wearing the title of “christian” who are tranhumanists, but the goals of tanshumanism are very much at odds with Christianity. Yes. Science has “detected” spirit. We call it information. Christianity is based on FAITH. Transhumanism is based on SCIENCE. Science also depends on trust in non-contradiction, spatial and temporal uniformity, causality, etc. Faith is inescapable, but we don’t need to be irrational. Max, thanks for the link. I want to press you on this further. Would you please define “faith” and tell me why it’s not applicable to causality? Wrong. Christianity is based on historical fact. There is more evidence proving that the Bible is true and there is about any other ancient writing. Furthermore, science is not what it’s cracked up to be anymore. For example, the theory of evolution (notice it’s a “theory”) has become an embarrassment to the scientific community. The first rule of science states that whatever is being studied must be observable. Were you there at the beginning of time? Was anyone there? The only account we have of anyone being there is found in the Word of God. Genesis 1:1, “In the beginning, GOD created the heavens and the earth.” If this was the only piece of evidence I had, I would question it too. However, the entire Bible has been proven authentic along with everything in it; thus, I believe Genesis 1:1 to be true as well. Don’t believe my word; check into it for yourself. I mean, come on, we learn something new every day, judaism is so transhumanist, christianity, well obviously jesus was a transhumanist, and well then that means certainly mohammed was transhuman because he got to rise up and travel the universe in a huge spaceship! or, more likely, you are just badly misinterpreting mythology. you could as well say that nordic mythology is transhumanist, thor looks like transhuman to me, with that mighty hammer and commandeering of natural forces! So, you have scientific proof that our universe as we know it, including us and our memories, couldn’t be created, say, just six minutes ago? Anonymous, no one can prove anything to a skeptic. We all work within a context of premises. Science, logic, math, reason, all have their axioms and methods. However, it appears (only appears, because it all could have been put in my mind moments ago by an evil demon, of course) that some sets of premises work better than others. It appears that some sets of premises are being selected out, while others are being selected in. I imagine time will tell whether your fundamentalism will prove more resilient than alternatives. Which is exactly what I am talking about. Eray, you’re right: Transhumanism is not new, except in name. All major religions have Transhumanist aspects. Even the earliest religions incorporated such ideas. Whether Christianity contradicts science depends mostly on your interpretation of Christianity. You’ve decided to interpret Christianity in a way that necessitates contradiction. I’ve chosen otherwise. Creationism is false? How exactly did you prove that. Even many top scientists now are subscribing to intelligent design, life being too complex to explain away as an accident. I submit that evolution is as much a matter of faith as the the “theory” is seeks to supplant. He means that christianity is so flexible that it can be made “consistent” with just about anything. I wonder what they will think when we encounter the first aliens, surely they must have a jesus with a cross “consistent” with their number of appendages. Or maybe they should just worship the human-jesus. Eray, your understanding of Christianity is as dogmatic as that of fundamentalists. The only difference is that you reject a particular dogmatism while they embrace it. I share your rejection of fundamentalism. I don’t share your dogmatism. It doesn’t matter what religious people think about the Singularity. The future is coming and they cannot stop it. If religious people were likely to strongly oppose the Singularity we’d have experienced stronger opposition to Stem Cell research, computers, smart phones, Watson, Deep Blue etc. The vast majority of religious people don’t care about technology but some people in the futurist community are paranoid. Their paranoia is that there will be a mass uprising against technology. Some futurist people need psychological counselling to help them cope with their paranoia. They fluctuate from fearing AIs/robots will rebel to enslave us, AIs will turn the world into a paper-clip making mahcine (or Grey Goo), or there will be a religious neo-Luddite (anti-tech) human rebellion. In accord with Self-Fulfilling-Prophecy, the fears of paranoid futurists are the most likely thing to cause such fears to come true. For example if futurists continually highlight an non-existent divide between futurism and religions they could eventually create that divide simply by telling people it exists when it doesn’t. Stating Christianity and Transhumanism are not enemies is absurd because it is similar to stating humans and water are not enemies. If Masses of people manically start hollering that: “WE HAVE NOTHING TO FEAR FROM WATER, DON’T HATE WATER,” then some people will start wondering if maybe there is actually something to fear regarding water because why are all these people shouting about how water is not fearsome. Some Transhumanists are attempting to make their unreal fears real. Antichrist, according to the Bible, is that “god” that would raise itself above all others. Ironically, that is precisely the kind of being you worship, if you’re like most fundamentalist christians. In contrast, the Bible presents Christ as the God that would rise together with us in the shared glory of God. Jesus was not a “God”, he was a prophet of God. This entire “Jesus-is-God” stuff and resurrectory symbolism are relics of heathen Apollo/Horus/whatever cult. Western Christianity was corrupted by gnostic cults. Transhumanism is exactly one of such cults, with its “Rapture of the Nerds” scenario and quasi-religious heathen message. Basically, modern-day Satanism. Singularity Utopia, I partially agree with you. The challenge is that fundamentalists (both religious and antireligious) have already decided and have long been acting on the decision that there is an incompatibility. My bet is that ignoring them will not solve the problem at this point. Additionally, for those of us that are religious, there are high stakes as our various religions ruminate on how best to deal with these issues. We’ll benefit from making constructive pathways for our fellows. Transhumanism is a satanic abomination and must be destroyed. Amen. Those who worship death see evil in life, and Satan in eternal life. In their nihilism, they worship the “god” that would raise itself above all else, rather than the God that would rise together with us. Such are religious fundamentalists, ancient and modern, who, as Jesus described them, would make another two fold more a child of hell than themselves. Some things haven’t changed. You’re just scared of death, because you know that you’ll go to Hell for your sins. Anonymous, your fundamentalist christian heaven would be hell for me. If I go to your hell, and if I find that it’s not heaven, I’ll do what I can to make heaven of it. It’s the best I can do. And I’ll be screwing my 72 virgins in paradise. This does bring up a question: if a super-intelligent being thought about God, or a god, how would it envision that divinity? Humans conceive of God as, essentially, a more powerful version of themselves. Sometimes, they also think of their saviors and prophets as more moral versions of themselves. Would transhuman doing something similar. Or, to put it all another way, would a transhuman have a trans-God? Victor, something like that makes sense to me: a posthuman God is one that progresses eternally. As a student at George Fox Evangelical Seminary I would have to say that your points are very well made. Many of us would argue that the main purposes of Christianity: love, healing, and restoration are very compatible with the goals of Transhumanism. I think we have an important role to play, especially in terms of helping devise an ethical framework in which to move forward together. My primary concerns tend to be around the possible consequences of unequal distribution of resources that plague us now. The big question is will Transhumanism really change this or will humanity muddle on as usual after the singularity. I am enough of a realist to figure that unless we do something really spectacular that changes human motivation on a fundamental level the higher probabilities are muddle on or extinction. Gil, the “main” purpose of Christianity is not all of the items you listed. The main purpose of Christianity is SALVATION through JESUS the Messiah. Out of this living relationship with Him (the risen Messiah) flows love, healing, restoration, etc. Study the book of James for a clearer understanding. As a Christian apologist I must say that this article represents a fundamental misunderstanding of Christianity. I have responded here: http://www.logosapologia.org/?p=2893 For the sake of clarity, Lincoln Cannon is Mormon and does not speak for Christians. Do not confuse the two. Cris, I am indeed a Mormon. I am also a Christian, even if you don’t like it. Lincoln, Mormons are not Christians. Sure, you believe in good works — so does practically every other “faith.” But good works is not what “makes” a Christian. A Christian is one who has surrendered his/herself to Jesus the Messiah. He/she is constantly allowing Him to be to be Lord and Savior of his/her life. Good works is the flowering out of that relationship; it is not the cause of it. Lincoln please stop speaking for Christians, you know that Mormonism is radically different from Christianity! Cris, I happily acknowledge that my Christianity is radically different from your fundamentalist Christianity. Lincoln it is demonstrable that the crudely crafted spirit brother of Lucifer, Jesus of Mormonism is radically different than Jesus Christ in the New Testament. You can call yourself a Christian but it is transparently disingenuous. Ah, Cris, so you claim. On the other hand, I claim it is demonstrable from the Bible that you worship the antichrist, that which would raise itself above all else called “god”. You are a nihilist worshipping death, whether or not you call yourself a Christian. Assuming for the sake of argument that John 11 relates a historical event, what happened to Lazarus afterwards? 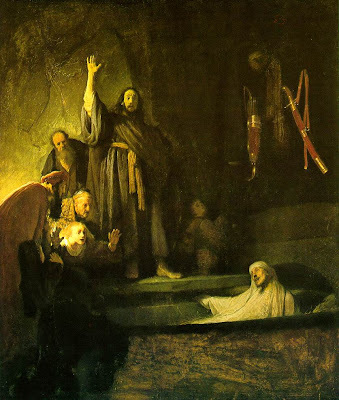 Either he died later, which makes his spooky resurrection kind of pointless; or else we would have to postulate that Lazarus in 2011 wanders the earth in his deathless body like a character from Highlander. Life is never a waste. Jesus’ supernatural healings and resurrections didn’t stick, otherwise we’d have some very old people on our planet now. That suggests that Jesus doesn’t really have anything to do with transhumanists’ goals. Mark Plus, thus far doctors’, pharmacists’, and transhumanists’ attempts at immortality have not stuck, either. (And won’t in any complete sense until we can do away with car accidents and terrorism, in addition to disease and aging.) Does that make our pursuits un-transhumanist? Transhumanism is a complex, long process that takes us to posthumanity. I think you have Jesus confused with a pagan physician like Hippocrates or Galen. Christians believe that the ordinary rules of reality didn’t apply to Jesus, so his medical accomplishments would have to stand out, and spectacularly so. So again I ask: Why don’t we see people alive in 2011 whom Jesus didn’t merely patch up with the help of natural healing processes, but whom he really, really HEALED? Mark, maybe the healings were metaphorical, maybe they were temporary, maybe they were literal and the persons are hiding from us? I’m less concerned with the historicity of the healing miracles (which is not to say that the matrix architect cannot do as he pleases, so to speak) than I am with Jesus’ message. Transhumanists, above all, should recognize that some things are worse than death. Out goal should not merely be avoidance of death, but rather life of ever grander possibility. This will require not just the creative power if technology, but also the preserving and meaning-imbuing power of benevolence. Jesus taught and exemplified something like that. I don’t understand your comment. Do you mean that an immortal Lazarus would have suffered a fate “worse than death”? What if he had an opinion about his state different from yours based on his own experience? Yeah. I mean something like that. When we look at the world, we see all kinds of evil. If there is no purpose to that evil, either there is no God, or he’s not benevolent, or he’s impotent to some extent. If there is a God, and I trust that there is, then some combination of limitations to power and purpose for the evils we experience makes sense to me, depending on the motives we attribute to God. For example, I don’t think it makes any sense to assume God just wants us to be happy in a simple way. Rather, I suspect God wants to create more creators – genuine creators of truly novel creations. To do that, God would need to relinquish us, or we would just be prosthetic extensions. Perhaps not having an opportunity to pursue our potential is a fate worse than death? Religion has no place, under any circumstances, in the advancement of the human race. Don’t bother trying to justify transhumanism to christians because those intelligent enough to grasp the concept of transhumanism, at least deep down, know there is no such thing as a supernatural god. So yes, all scientific pursuits are inherently at odds with any ridiculous religious ideologies. Logic and reason are now, and forever will be at odds with theism. Irrational as religion is, it makes people happy, or so they say, so I would be cautious in over-generalizing like this. Doc Freezy, religion is not necessarily about supernatural gods. I am a religious person, I identify as a “Christian”, and I reject the idea of supernatural gods. The God I worship is a benevolent and creative posthumanity, which we should emulate and become. I take issue with your statement. They would torture you and burn you at the stake for heresy a few hundred years ago for saying these absurd things. In other words, what you say has absolutely nothing to do with christianity. You are just a naive child who has fantasies about christianity (you don’t know what christianity is) and “posthuman gods”. Incidentally, I don’t think an autonomous AI would like much either, why should they like a person who is gullible enough to believe in christianity, and more so a christianity that person does not understand? That is to say, I think your brain patterns would better remain in the flesh rather than retained in a digital mind. You would be like the windows of posthumanity 🙂 Ha! Eray, I recognize that there have been and are “Christians” who match the characterization you provide here. You should recognize that there have been and are Christians who do not match your characterization. Christianity is far broader than you’re allowing for in your statements. Tonweya, I agree with Eray in part, too. I’m sorry you’ve not had the opportunity to meet other kinds of Christians. I’m far from alone. Matthew, I’d rather be unhappy and enlightened, than ignorant and bliss. Science and progression is not here to cater for someones feelings and happiness. Children aren’t any less happy they find out Santa Claus isn’t real. They accept it and move forward, adults seem unable to do this. Had we not had Abrahamic religions our civilization would be astronomically further down the road to a singularity. In no way can you cherry pick only the good parts of religion and claim it as a viable alternative to a secular society. Doc freezy, you have no way of knowing what would be without religion. In fact, it seems clear that human religion was inevitable, judging from its presence in all cultures. Of course it is speculation, however knowing the extents to which the churches of the past 1500 years have suppressed ideas and learning I’m not sure you have much options other than to believe we would have advanced much further. It was inevitable… and? was there a point to that sentence? Ignorance is inevitable for some people, I’m not sure you’re the exception. I love the contempt for about 80% of the human race, who are apparently too stupid to grasp the awesome truths which you have so easily found. Why not throw in a “sheeple” while you’re at it? Full ack. There is just no point in trying to figure out, if some oldfashioned character in some outdated book of fairytales would have liked a recent scientific concept. What about the very common view that the normal human lifespan of about 120 maximum years (or very near it) is what God wanted? So going beyond this limit, which some find evidence for by reading a certain familiar passage, say that extending life beyond this point is sinful? That’s what I always thought. Furthermore, what about the plain fact that Christians didn’t come up with this idea thousands of years ago? That is, if this is such an obvious good idea, why weren’t Christian scholars focused on radical life extension early on? Just because human beings didn’t know about it doesn’t mean God didn’t. And certainly if God wanted us to have the knowledge, he would have enabled it, right? If it’s that important, that is. Or, at least this is how I thought when I was a Christian. I am not anymore though. How one interprets the Bible is a debate in and of itself, completely separate from this discussion, but I feel that the rational, scientific thinking of transhumanists would not view the Bible as literal historical fact–even those who are Christians. In this light, it would be absurd to believe that humans lived more than 100 years (Abraham, Isaac, Jacob, etc., according to Genesis), especially when considering what civilization was like in the Near East around mid-1st millennium BC. In regard to Jesus healing the sick, I have trouble agreeing with the way you equate Jesus’s miracles with medicine. Yes, he was doing a good thing, and it was all for the purpose of demonstrating his power as Son of God to those who lacked faith, but remember that in those times people didn’t view disease as a health/physiological problem. Sickness was seen as the result of demons or some kind of evil. Therefore, Jesus has power over evil as opposed to nature (“flinging entire mountains into the sea”) which is the creation of God. However, I do agree with you that transhumanisn and Christianity are not dissimilar. They both seek to transcend the human condition, whether through physiologically changing (or discarding) the human form, or by achieving eternal salvation with God in life after death. I see. I was thinking of Genesis 6: 3, but I also agree this is a hard nut to crack. Different times, different human standards. I think what you are proposing is another change to Christianity, much like Mormon’s consider their theology an “update”. But, Christianity can be considered a fulfillment of Jewish prophecy…so I don’t see what the big fuss is. But then again, I am no longer a Christian. Good luck. Somewhere, there is a Christian cult you never heard of with 100,000 members that believes something highly contrary. They can’t all be right, all the different theologies. I would consider rejoining my childhood faith if they would start eliminating theologies much like scientists (effectively) eliminate hypothesis. Do you see this happening anytime soon? Matthew, there is a long Christian tradition of trust in the ideas of theosis and pursuit of immortality and eternal life. Consider the origins of the tales of the fountain of youth and the practices of the alchemists. These are not new ideas. So you view transhumanism ideals, achieved through science, as another way of achieving what we would receive through death automatically? But isn’t that skipping the science part? Ie, the elimination of religion(s) idea? Matthew, I think the common religious idea that one must die to go to heaven is escapist and nihilistic. Some Christians do teach such an idea. However, some of us embrace the idea that heaven is attained in transfiguration beyond traditional notions of death or resurrection from death to life. Some of us also embrace the idea that science and technology are means for becoming as God, and that the opportunity itself is the grace of God. Ok, so this seems to boil down more to what people want than what is actually historically available as evidence. It’s not that I don’t like your new ideas about Mormon thology (sister is a Mormon), but I like a religion even more when it can be shown to be erroneous. Do you hold your philosophical beliefs to this standard? Do other christian transhumanists? On one hand, a primary benefits of religion is that it can, better than anything else, excite a strenuous pursuit of a benevolent and creative posthuman future. For practical and moral reasons, I’m strongly opposed to testing the hypothesis that such a future is impossible or that we can prevent such a future from happening. For some hypotheses, trust even without readily available evidence is the most rational choice. On the other hand, I welcome scientific investigation of my religion. That, not because I think my religion is so super that science would only verify everything about, but rather because I trust the investigation would promote ongoing change for the better. I don’t believe in absolute truths or final religions. Religion is evolving as it always has, and I expect that to continue for a long time. Christianity (and all the other superstitions) teaches that god made the humanity, trans-humanism is about humanity creating gods through science and technology. Science is the opposite of blind faith. A computed world has nothing to do with bronze age superstitions, like Christianity. I agree that there is (very) small chance that we live in a computer simulation (or an artificially created physical Universe). Even if that’s the case, it’s not clear at all that the simulation (or the Universe) has been created for us, or even that the creators are aware we are in their simulation. I find eternal inflation theory much more compelling as a creation theory than “we are all sims in a computer simulation”. The major issue that I have with the simulation argument is that the Universe is probabilistic (see quantum theory). So running the simulation multiple times will always lead to different results (even if the “code” is the same). So it will make no sense for post-humans to run a simulation of their history, because they will not simulate their own history, they would simulate a different Universe. Accordingly, if we live in a simulation, we are NOT the purpose of the simulation, the creators of the simulation are drastically different than us (and their ancestors where different than us) and they don’t care about us. So it make no sense for us to even think about them as our Gods. Scovidiu, it takes either a myopic view of the world or an emotional blindness not to see the possible compatibilities between Christianity and the Simulation Argument. Of course, you DO see the compatibility, which is what moved you to propose a criticism of the argument. Your criticism is of one of the premises of the argument: it may be, as you suggest, that posthumans do not compute many ancestor worlds. However, we humans are already doing quite a bit of that (at relatively low resolution), so it seems odd that we would stop if and when we become posthumans. No, we currently don’t simulate the Universe at any resolution. A simulation of our Universe would imply the simulation of the physical laws of it, laws that we observe and that are our reality. My issue with the simulation argument is not that a (very) advanced civilization would not be able to simulate our Universe (although it may not be physically possible). I am saying that the simulation of our Universe would produce different results at every run, because our Universe is probabilistic. If we’d code the physical laws of our Universe and start up the program (from the Big Bang), we would NOT create humans after 14 billion years, we’d produce something totally different. A direct logical consequence of this FACT: if we live in a simulation, it was not created for us, we are just a side-effect, so it makes no sense to waste our time to “worship” our creators. So, yes I see a compatibility between Christianity and the Simulation Argument, both are crap: one is bronze-age crap, the other one is information-age crap. Scovidiu, what do you think of Richard Dawkins’ assessment that evolution is progressive? If he’s right, the universe may indeed predictably produce creatures like us, and perhaps intentionally so. Perhaps advanced intelligence is a successful mechanism of inheritance in cosmic evolution? One of the things that never made sense to me in the simulation argument, is that the smallest point in which we can store all of the data that makes up an individual atom is, an individual atom. Atoms cannot model multiple other atoms. This applies to a quantum superposition as well. No computer can fully 100% emulate itself down to the atomic level without simply being itself at the atomic level. Creating a simulation of the universe from the subatomic up would literally involve a direct physical replication of the universe as matter. You just can’t store information any more compactly. And at that point, the fact that the universe is a simulation is just semantics. Perhaps any given universe is computed only to the extent it is being observed? I was thinking the same thing. A simulation may be confined to one world, one nation, one family, or even an individual. All the necessary scenery for travel could be computed ad hoc as required. And we already do this on a very small scale – I imagine that posthumans might invent realistic worlds for the same reasons that humans do. Likewise, simulations do not have to begin with the Big Bang or be modeled on an existing universe, any more than our simulations of Middle Earth or The Old Republic are faithful representations of our own history. We don’t know how easy is for an Universe to create life or intelligence. Maybe you have one billion civilizations per Universe, maybe you need one billion Universes to get a civilization. And in any case, each civilization would be different and you could not control what you would get. Evolution would not produce the same tree of life. Evolution depends on the cosmic environment, the cosmic environment is quasi-random. If (and it’s a big if) advanced intelligence (capable of producing new Universes) in any form is the purpose of our Universe, then it’s not us. We are not advanced intelligence. We are at most just a step toward that, as important as any of our evolutionary ancestors (including single cell ancestors). And, most likely, we are just one random shot at advanced intelligence. If we fail, other random civilizations in this Universe (or other Universes) may succeed. Scovidiu, evolution is not so random. Given understanding of environmental constraints, it is predictable. Consider the anatomy of dolphins and sharks, despite having totally different family trees. The argument here is compelling, according to traditional Christian thinking after the apocalypse humans are supposed to live forever, as they did before original sin. And the apocalypse and a singularity have incredible similarity in their end result. After a period of turmoil the world is going to be forever changed and ruled by beings beyond human capabilities and comprehension. However, Transhumanism and Christianity have a conflict in the source of the transformation, immortality, and God(s). Transhumanism believes the source of these things is technology and Christianity believes the source is supernatural. Therefore, the two ideologies have a conflict in methods, not ends as it first appears. Thanks for posting that link. Before reading those quotes, I would’ve assumed that Christian belief in human godhood was peculiar to Gnosticism (and later Mormonism). Now I’m starting to think Christianity itself may have originally been a transhumanist movement 2000 years ahead of its time. But he himself that justifies also deifies, for by justifying he makes sons of God. ‘For he has given them power to become the sons of God.’ If then we have been made sons of God, we have also been made gods. Yes, I personally see the two as perfectly compatible. Like Augustine, I see that if we are to be sons of God, then we are to be gods – or something like it. I also keep in mind that “God is Love”, and the whole symbolism of the Church as the Bride of Christ – keeping in mind the idea that with marriage “two become one flesh”. Even among the first apostles, Christ frequently told them that they did not understand what he said – so why do modern Christians so often presume that their understanding is the only correct one? I take it that “God” is, in fact, the love that unites mankind; that our Faith must be Faith that other human beings will mostly behave decently, and that we must love one another and trust in one another if we wish to reach the Heavens…. That is not to say we should not use our brains. The symbolism of the Church as the Body of Christ shows that some people are meant to be the feet, others the hands, and yet others the eyes, mouth, ears, and brain of the Church – and somewhere, someone is doing active duty as the spleen. Those of us who have brains should use them, and whether we call it the good of humanity, the Body of Christ, God, or the market, it is all pretty much the same: it is by our free association and voluntary cooperation that the Future will be better than the past. The danger, as I see it, is that some people lack faith in the whole, and believe that they can choose (or be) the one who ties everyone together and forces everyone to move together in lockstep – and that will never work. It is only through Faith in the Love that ties humanity together that we can take advantage of the broad range and diversity of humanity to our mutual advantage – or, in other words, Faith in God … and it doesn’t require some mythical being in robes looking down on us all. Sometimes I wonder, if time travel is invented in the future, how would our future selves guide humanity to that golden future? I wonder if several of the “holy texts” aren’t inspired after all. Yes the conflict is that one is humanistic and the other glorifies God as creator. The fact that the author of the post above misses this reveals a fundamental misunderstanding. The fact the goals are similar but the means are different is the conflict – they are antithetical. Transhumanism usurps Christ’s job description, in that way it is antichrist. Hi Cris. Is this one of those I-know-you-are-but-what-am-I moments? You know, where you call me antichrist, and I return the favor? You tell me I’m usurping the role of Christ, and I remind you that Jesus invited us to be Christ? You tell me that we should worship that which raises itself above all else called “god”, and I remind you that worshipping such an idea is exactly what the Bible identifies as antichrist? We’ve done this all before. THANK YOU, CHRIS! 🙂 You took the words right out of my mouth. “Nevertheless, death ruled from the time of Adam to Moses, even over those who did not sin in the same way Adam did when he disobeyed. He is a foreshadowing of the one who would come. But God’s free gift is not like Adam’s offense. For if many people died as the result of one man’s offense, how much more have God’s grace and the free gift given through the kindness of one man, Jesus the Messiah, been showered on many people! Nor can the free gift be compared to what came through the man who sinned. For the sentence that followed one man’s offense resulted in condemnation, but the free gift brought justification, even after many offenses. For if, through one man, death ruled because of that man’s offense, how much more will those who receive such overflowing grace and the gift of righteousness rule in life because of one man, Jesus the Messiah! Consequently, just as one offense resulted in condemnation for everyone, so one act of righteousness results in justification and life for everyone. YOU ARE RACIST, if you are against Transhumanism; believing that the ‘human race’ is the best race ever and no other race should exist! CHECK MATE, haters!